The new colonial movement: India has requested science instruments proposals from the international community for its planned Venus orbiter, set to launch in 2023. For me, the big news with this article is that it is the very first I have seen that actually spells out Sivan’s first name. Since he became head of ISRO in January 2018, he has only been listed as “K. Sivan” in every single article, even those describing his background when he was appointed. Now that I have learned what a tongue-twister that first name is, I can understand why they abbreviate it. On a more serious note, this article indicates the growing maturity of India’s space effort. They not only are planning a mission to Venus, they will fly missions to the Moon in January and Mars in 2022, and intend to launch their first manned mission in that same time period. A failed Soviet-era probe to Venus that never left Earth orbit is now predicted to crash to Earth sometime between 2023-2025. The Kosmos 482 interplanetary station, which was unsuccessfully sent towards Venus in 1972 by the USSR, may crash land on Earth between 2023 and 2025, astronomer and cosmonautics historian Pavel Shubin told Sputnik. He couldn’t pinpoint the exact location of the future crash site, but noted that it would be between 52 degrees north and 52 degree south latitude. It is not likely that this probe will land anywhere where it can be recovered, as most of the Earth is ocean. However, the scientist’s hopes are not unreasonable, as it is always worthwhile for future engineering designs to study how the environment of space effects materials over long periods of time. 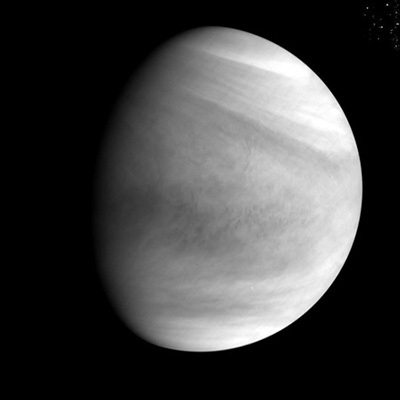 The uncertainty of science: Scientists have now proposed two new best candidates for the unknown major component in Venus’s upper atmosphere that was first identified in 1974 when Mariner 10 took the first good close-up images. 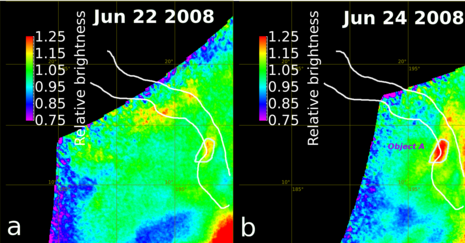 We have analyzed spectra taken during the second Venus flyby of MErcury Surface, Space ENvironment, GEochemistry, and Ranging (MESSENGER) spacecraft on its route to Mercury, in 2007. Using a numerical code, we have reproduced the light reflected by the equatorial atmosphere of the planet and retrieved the distribution of particles in the upper atmosphere of Venus, with a cloud top of some 75 km above the surface. We have also retrieved the absorption spectrum of the puzzling absorber and compared it with some previously proposed candidates. While no perfect match is found, sulfur-bearing species (S2O and S2O2) provide the best agreement. There is still a long way to undoubtedly identify Venus’s UV absorber, but this work provides substantial spectral constraints. The dark absorber shows up as dark streaks in the upper atmosphere, and allows images to track wind and cloud movement. No one has been able to firmly identify it. S2O and S2O2 are disulfur monoxide and disulfur dioxide respectively, both of which are unstable on Earth. The first is thought to have been detected in Io’s numerous volcanic eruptions, with it settling as a solid around at least one volcano, Pele. The second has already been suggested as the dark absorber. This research helps confirm that earlier research. Note however that other research says there is too little sulfur in Venus’s atmosphere for this to be its dark absorber. The science here therefore remains decidedly unsettled. Link here. The article begins by focusing on new hardened computer chips that can survive the harsh conditions of the Venusian surface, then moves to discussing our state of knowledge of the Earth’s sister planet, and the possibilities of future missions. Exploring Venus is essential and necessary for us to truly understand how planets form and evolve. Developing technology that can survive that harsh environment is equally necessary, as it will make all future space exploration easier and more capable. This engineering work appears to be taking the first steps in this direction. India’s space agency ISRO has issued a request for proposals from Indian scientists for the scientific instruments to be installed on a future probe to Venus. The payload capability of the proposed satellite is likely to be 175 kg with 500W of power. However these values are to be tuned based on the final configuration. The proposed orbit is expected to be around 500 x 60,000 km around Venus. This orbit is likely to be reduced gradually, over several months to a lower apoapsis. All told it appears that India is moving forward with this project, and probably intends to build it much like they build Mangalyaan, their successful Mars orbiter, quickly, efficiently, and for relatively low cost. Japan has been forced to shut down operation on two of the five cameras on its Venus orbiter Akatsuki. They think the problem has been caused by the additional five years required to get into Venus orbit when its main engine failed to fire during the first orbital attempt in 2010. During those five years the spacecraft was exposed to more radiation that expected, possibly damaging its equipment. The Japanese Venus probe Akatsuki has discovered a giant persistent wave in the planet’s upper atmosphere that almost spans its entire face. This week, researchers from Japan Aerospace Exploration Agency (JAXA) published infrared and ultraviolet images of Venus, taken by their Akatsuki orbiter between December 7 and 11, 2015, in Nature Geoscience. Akatsuki’s pictures reveal a curved region roughly 6000 miles long (Venus’ entire diameter is just around 7,500 miles) with a higher temperature than the surrounding atmosphere. How did the curved “smile” fight those high winds to remain in place for all four days of observation? The answer may lie in a phenomenon very familiar to Earthlings. Gravity waves, not to be confused with gravitational waves, form when gravity pushes and pulls at the seam between two different materials. Waves on the ocean are perhaps the most obvious example—they exist where the sea meets the sky. But gravity waves also show up in the air, where wind flows over mountains to form waves that undulate upward through different layers of the atmosphere. The mystery here is that scientists do not have a mountain chain that could have caused this giant Venusian wave. Moreover, it was there in 2015 but they haven’t seen it since. A clever mission concept, proposed as a joint Russian/U.S. unmanned probe to Venus, would use a solar-powered unmanned aerial vehicle (UAV) to fly through the atmosphere for at least a year in order to try to find out the nature of the planet’s atmospheric mysterious dark streaks. The dark streaks, first photographed when Mariner 10 flew past on February 5, 1974 and took more than four thousand pictures, are made of a still unknown material in the upper clouds that absorbs ultraviolet light. The scientists of this mission concept propose that these dark streaks could even be Venusian life. Intriguingly, the sulfuric acid droplets within the clouds aren’t necessarily a show-stopper to life. Earlier Venera missions detected elongated particles in the lower cloud layer that are about a micron long, about the width of a small bacterium. These particles could be coated in ring-shaped polymers of eight sulphur atoms, called S8 molecules, which are known to exist in Venus’ clouds and which are impervious to the corrosive effects of sulfuric acid. Furthermore, S8 absorbs ultraviolet light, re-radiating it in visible wavelengths. If the particles are microbes, they could have coated themselves in S8, making them resistant to the corrosive effects of sulfuric acid. It has even been postulated that the S8 exists as a result of microbial activity. The uncertainty of science: A new analysis of past data from a variety of Venus orbiters suggests that at least one volcano is active there. The review of old data from the Magellan and Venus Express orbiters suggests that some lava flows on the volcano’s slopes are fresh, though how fresh remains unknown. However, computer models and the detection of excess heat by Venus Express on the mountain’s eastern slopes adds weight to the theory that the volcano is spewing out lava. In a triumph of engineering, the salvaged Japanese Venus probe Akatsuki has beamed back to Earth its first science data. After an unplanned five-year detour, Japan’s Venus probe, Akatsuki, has come back to life with a bang. On 4–8 April, the Japan Aerospace Exploration Agency (JAXA) presented the first scientific results from the spacecraft since it was rescued from an errant orbit around the Sun and rerouted to circle Venus, four months ago. These include a detailed shot of streaked, acidic clouds and a mysterious moving ‘bow’ shape in the planet’s atmosphere. Despite the probe’s tumble around the Solar System, its instruments are working “almost perfectly”, Akatsuki project manager Masato Nakamura, a planetary scientist at JAXA’s Institute of Space and Astronautical Science in Sagamihara, Japan, announced at the Inter­national Venus Conference in Oxford, UK. And if another small manoeuvre in two years’ time is successful, he said, the spacecraft might avoid Venus’s solar-power-draining shadow, and so be able to orbit the planet for five years, rather than the two it was initially assigned. The timing is also good, since Akatsuki is now the only probe circling Venus, and will be for a number of years, until someone else approves, builds, and launches a mission. After a five year delay because its initial attempt to enter Venus orbit failed, the Japanese probe Akatsuki is finally about to begin science operations. Its present orbit is less than ideal, passing 440,000km from the planet at its farthest point. That is roughly five times greater than initially planned and means the orbit time is now nine days. The change in orbit has affected the probe’s observation plan. Of its seven planned missions, Akatsuki will be able to complete only one: taking serial images of clouds. Unfortunately, the probe’s five cameras, each capturing images in different wavelengths, including infrared and ultraviolet, will not be able to provide the same resolution at this greater distance. Observing volcanic eruptions on the Venusian surface may also be difficult. There is an upside to the situation, however. Takeshi Imamura, an associate professor at JAXA’s Institute of Space and Astronautical Science, says the longer orbital period means the probe will be able to collect longer continuous stretches of data. Considering everything, it is magnificent that Akatsuki will be able to do any science at Venus at all. Japanese engineers have confirmed that Akatsuki has entered orbit around Venus and can now begin science observations. The image on the right was taken by the spacecraft’s ultraviolet camera, and clearly shows the as-yet unidentified dark material in Venus’s upper atmosphere. These dark streaks have been seen since the first Venus fly-by in the 1960s, but no observations have been able to determine what the material is that shows up as dark in ultraviolet light. This success is a triumph for the engineers that operate Akatsuki. Kudos to them! Five years after the Japanese Venus probe Akatsuki’s main engines failed while trying to put it into orbit, the spacecraft today fired its attitude thrusters and was successfully inserted into orbit. This is a singular achievement by the Japanese engineers running the mission. They improvised a plan using the thrusters, which were designed to adjust the spacecraft orientation, not its course, and were able to get Akatsuki in an solar orbit that brought it back to Venus. A Japanese Venus research spacecraft, dubbed Akatsuki, has completed all its preliminary course corrections and is ready for a December 7 orbital insertion attempt, the second since the spacecraft’s main engine failed during the first attempt in 2010. The space probe accomplished its last targeting maneuver Oct. 11 to aim for its Dec. 7 arrival at Venus, and all systems are go for the encounter, said Takeshi Imamura, Akatsuki’s project scientist at JAXA’s Institute of Space and Astronautical Science. Imamura said the Akatsuki spacecraft, named for the Japanese word for dawn, will zoom 541 kilometers, or 336 miles, above Venus for a 20-minute insertion burn using the probe’s secondary attitude control thrusters. Japanese ground controllers have programmed the probe to use the backup rocket jets after a faulty valve knocked out Akatsuki’s main engine during its first attempt to enter orbit around Venus in December 2010. Four of the eight attitude control thrusters aboard Akatsuki will fire for 20 minutes and 33 seconds to slow the spacecraft down enough for Venus’ gravity to pull it into an egg-shaped orbit that skims above the planet’s cloud tops on the low end and ranges several hundred thousand miles in altitude at peak altitude. The reaction control thrusters, originally designed to help point the spacecraft, were not rated for such a hefty propulsive maneuver. To make this second chance possible, they have spent the last five years improvising. First they dumped the fuel from the now-useless main engine to make the spacecraft lighter so that the attitude control thrusters could handle the maneuvers. Then they used those thrusters repeatedly to adjust the course to bring Akatsuki back to Venus after it zipped past in 2010. If they succeed in getting it in a useful orbit on December 7, it will be real triumph for these Japanese engineers. Five years after it failed to enter Venus orbit as planned, the Japanese probe Akatsuki is about to try again, in December. The article provides an interesting and detailed explanation of what had gone wrong in 2010, and then describes the amazing things engineers have done to make this second attempt even possible. If they succeed it will be one of the most brilliant achievements in the history of space exploration. Cool image time! Using archival data from Venus Express, scientists have identified several spots on Venus where it appears there are active lava flows. There have been hints of volcanic activity on Venus since Pioneer Venus Orbiter first circled the planet from 1978 to 1992. This appears to be the first solid evidence of it. If at first: After failing to place its Akatsuki spacecraft into orbit around Venus in 2010 because of a cracked engine nozzle, Japan has announced its plans for a new attempt later this year. The attempt will be made on December 7. If successful, the spacecraft will begin studying Venus’s climate and atmosphere only a short time after the end of Europe’s very success Venus Express mission. After eight years, the European Space Agency has officially ended the Venus Express mission. After this month of ‘surfing’ in and out of the atmosphere at low altitudes, the lowest point of the orbit was raised again through a series of 15 small thruster burns, such that by 26 July it was back up to about 460 km, yielding an orbital period of just over 22 hours. The mission then continued in a reduced science phase, as the closest approach of the spacecraft to Venus steadily decreased again naturally under gravity. Under the assumption that there was some propellant still remaining, a decision was taken to correct this natural decay with a new series of raising manoeuvres during 23–30 November, in an attempt to prolong the mission into 2015. However, full contact with Venus Express was lost on 28 November. Since then the telemetry and telecommand links had been partially re-established, but they were very unstable and only limited information could be retrieved. The agency has decided that further attempts to contact the spacecraft would essentially be a wasted effort, and has closed the books on this very successful mission. The spacecraft itself will soon burn up in Venus’s atmosphere when its orbit decays. Engineers have been struggling to maintain contact with Venus Express, and have only been able to establish contact for intermittent periods. Europe’s Venus Express was launched in November 2005 and got to the second planet from the Sun in April 2006, on what was originally a two-year mission. Since then it has sent data streaming back from its polar orbit. But the probe’s days are numbered, and last month the flight control team at the European Space Operations Centre (ESOC) at Darmstadt, Germany, reported loss of contact with it. According to ESA’s Venus Express blog, it is possible that the remaining fuel on board the spacecraft was exhausted during recent manoeuvres and that the spacecraft is no longer in a stable attitude (the spacecraft’s high-gain antenna must be kept pointed toward Earth to ensure reliable radio contact). They have been able to get bits of telemetry from the craft, but since its fuel supply is almost gone the possibility of keeping it operating much longer is limited. Snowcaps of metal on Venus? A new look at old data of Venus has added weight to the theory that the planet’s higher elevations are coated with a frost of heavy metals. Years ago it was proposed that some sort of ferro-electric compound might be the cause of the brightening and the dark spots, but so far no specific compound has been identified which does the trick. Then again, with the surface of Venus being at almost 900 °F (500 °C) under more than 90 times the air pressure of Earth’s atmosphere at sea level, with occasional showers of acid, it’s not easy to test the properties of materials under Venusian conditions. “No one knows what explains the sudden darkness,” said Harrington, who will be presenting the work at the meeting of the Geological Society of America in Vancouver, B.C., on Monday, Oct. 20. After diving into Venus’s atmosphere on an aerobraking test that could have destroyed the spacecraft, the European probe Venus Express has now successfully used its last bits of fuel to raise its orbit back to research height. Its present orbit will probably decay sometime in December, when the spacecraft will burn up in the atmosphere. However, the scientists running the mission though that was likely to happen during the aerobraking maneuver. Instead, Venus Express is giving them about another half year of research. After spending a month dropping down deep into Venus’s atmosphere, engineers are now raising Venus Express’s orbit. Thus routine science operations concluded on 15 May, and the spacecraft’s altitude was allowed to drop naturally from the effect of gravity, culminating in a month ‘surfing’ between 131 km and 135 km above the surface. Additional small thruster burns were used to drop the spacecraft to lower altitudes, reaching 130.2 km earlier this week. Tomorrow, it is expected to dip to 129.1 km. After eight years orbiting Venus, the mission is finally ending. They will use the spacecraft’s thrusters to lift it back up to almost 500 kilometers, where they will then allow its orbit to naturally decay, eventually ending the mission when it burns up in the atmosphere. There is also the chance they will run out of fuel during these last burns, ending the mission slightly sooner. After concluding eight years of science observations in orbit around Venus, Venus Express is about to begin a series of atmospheric plunges to test the engineering of aerobraking at the extreme. They plan to dive into Venus’s hellish atmosphere as low as 80 miles, where they hope not only to get data about this little studied region but to also learn more about the engineering of aerobraking. The article also gives a nice overview of the knowledge that Venus Express gathered in the past eight years. Scientists think they have detected active volcanoes on Venus. We should hear more about this story in the next couple of days, after the scientists give their presentation at a science conference today. Note too that this result would only confirm other data, such as the fluctuating levels of sulfur in Venus’s atmosphere, that have suggested active volcanoes hidden under that planet’s thick cloud cover. A London university has digitized and placed online a collection of historic space images. I don’t think the press release’s claim that these images have never been online before is true for all the images. Nonetheless, the online availability especially of the Russian Venus images is very welcome.